The gallium nitride (GaN) presents very good mechanical, chemical and physical properties, as high velocities. These properties make it more attractive for high power, temperature and frequency electronic applications. In this paper, the main electrical properties of GaN are first presented; then its advantages over the other semi-conductors are studied. In the following section; the main steps of the used method, Monte Carlo simulation, are described. The next section is concerned with a study of some electrical properties of bulk GaN. In stationary state, we calculate electron mobility according to temperature variation, and drift velocity according to electric field variation. In transient state, we calculate the electron velocity according to time variation. We consider the acoustic, piezo-electric, ionized impurities and intervalley polar optical phonon scatterings. The results we obtained are in good agreement with those obtained by other researchers in the same field. The LEDs and lasers of II-VI semi-conductors, manufactured for emitting in the green and few fringes of blue,have high densities of dislocations, and therefore a short life.The blue LEDs based on SiC, have limited quantum performances because of indirect gap, they also require high currents when used in outside environment displays. In addition, their wavelength at peak emission is not saturated in blue; they are unable to cover all the choice of emissions spectrum to be used with red and green LEDs.The researchers are much more interested in the gallium nitride in which they hope to exploit its direct band gap in order to achieve high performance light emission. The band edge emission occurs at 365nm which corresponds to the ultraviolet; but by varying the composition of InGaN and AlGaN alloys; one can cover the entire visible and the ultraviolet spectrums. The LEDs based on InGaN have the purity of the desired spectrum and performance quantum twice better than their equivalents in SiC, in magnitude.The efficient emitters of blue and green, used with ordinary red LED and bright yellow, allow a display of full color. This represents a strong demand by consumer electronics industries; and it is in this area that the LEDs of GaN dominate the other potential systems such as the SiC.The electronic devices of Si, GaAs and their alloys are limited in temperature and power, especially in short wavelengths. GaN competes with them; and therefore it dominates in this scope. In fact; it presents a great direct band gap and therefore a large breakdown voltage, a great thermal and chemical stability and a high electron peak and saturation drift velocities. These qualities make it more attractive for electronic applications in high power, high temperature and high frequency. Whatever the technique of growth, GaN is n unintentionally doped, with a concentration of 1016 to 1019cm-3. This doping is often attributed to intrinsic defects resulting from a lack of nitrogen. The control of electrical properties of GaN remains an obstacle to the development of devices with high performance. To obtain a desired p or n doping, we must reduce the density of these donors to prevent the self compensation phenomenon. Such a phenomenon may stem from a variation of the electrons concentration and holes residual impurities, or from a variation of the concentration of native impurities (lacks of Ga and N). GaN usually crystallizes in the wurtzite (or hexagonal, noted -GaN or h-GaN) phase, and it is commonly developed on sapphire substrate which is a thermal and electric insulating, making it difficult to be integrated in microelectronics. However, we can get the zinc blende (or cubic, noted -GaN or c-GaN) phase on zinc blende substrates (e.g. Si, SiC and GaAs) under certain conditions. Its development on conductor substrates would allow its integration in microelectronics. The residual doping is lower for c-GaN than h-GaN, and some theoretical calculations have shown that it has several advantages on h-GaN. h-GaN admits two mesh parameters: "a" in the plan and "c" outside plan, which were reported for the first time by Juza and Hahn (a=3.18Å and c=5.16Å). Many other measures have been made; but the values generally used arethose of Maruska and Tietjen: a=3.189Å and c=5.185Å . Its gap is greater than that of c-GaN, which provides greater thermodynamic stability. c-GaN admits a lattice parameter whose value is given, according to the one of h-GaN, by the formula: aZB = aWZ×21/2 . Several values are reported, we include: 4.452Å by Pugh (1991); 4.50Å by Strite (1991), Xu (2000),Meyer (2003); and 4.53Å by Powell (1993) and Okumura (1998). It has a greater symmetry than h-GaN; the charge carriers suffer less of phonon scattering, and this allows it to have electronic properties much more efficient, larger electron peak and saturation drift velocities. The simulation allows completing two core functions. The first is devoted to probability theory from the usual expressions. 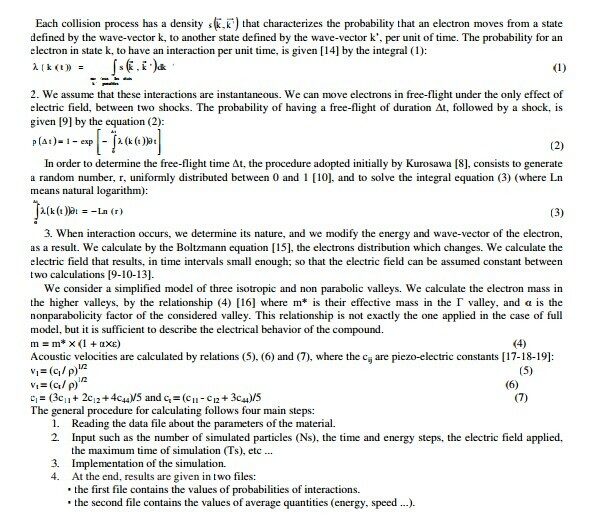 The second function is for determining the instantaneous quantities defined on a set of electrons (energy, speed, position), by the "Self Scattering" method  for which the free-flight times are distributed for each electron. The implementation has been adopted initially by Kurosawa , and then improved by Rees, Fawcett and Price [5-6-7-8]. It is based on a process of drawing lots from the laws of probability of interactions. Such interactions are suffered by the carriers during their movement in the compound [9-10-11]. 1. We statistically study possible energy exchanges between electrons, modes of lattice vibration and impurities.This allows us to calculate the probability of these interactions and their action on electron energy and wave-vector. For c-GaN; the only experimental value available for the electron effective mass, which is obtained by spin resonance measurement, is: m* = 0.15 × m0.For h-GaN, several values are reported in the literature; we take the most used (given by Drechsler, Barker and Illegems): m* = 0.20 × m0. This small difference between masses would benefit the c-GaN to the electron mobility.However, the two phases possess the same density  and the same dielectric constants, because of unavailability of experimental data for c-GaN [17-21]. Much more; the potential of acoustic phonon and of polar optical phonon parameters are the most determinants of mobility at low field, and they are the same for the both phases . c-GaN and h-GaN possess therefore similar parameters of scattering, in low field. Consequently, they have the same electron mobility. 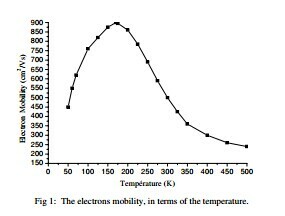 For n = 1017cm-3; we calculate the electron mobility according to temperature variation. The results are illustrated by Figure 1. The parameters taken into account in the Monte Carlo simulation, affect rather the scattering mechanisms to extremities of the low field and the strong field; but they do not affect the electron mobility to the considered electric field. • Below 70K, impurities are very near the conduction band; thus, ionized impurities scattering dominates. • From 70K; the polar optical phonon scattering begins to become important, and it dominates at temperature higher than 200K. • The mobility increases to a maximum of 900cm2/V.s for a temperature of 170K. After, it decreases to 500cm2/V.s for T = 300K, and it stabilizes toward a value of 240cm2/V.s at high temperatures. A region of negative differential mobility is observed. Up to 300K, the curve has a parabolic shape. Beyond this temperature value, the mobility is proportional to the inverse squared temperature. 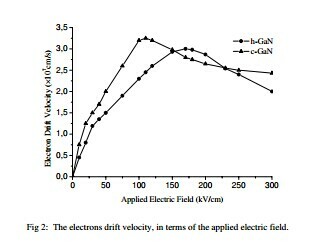 For the two phases of GaN, we calculate the steady-state electron drift velocity versus electric field E, for n =• Below 70K, impurities are very near the conduction band; thus, ionized impurities scattering dominates. • The mobility increases to a maximum of 900cm2 /V.s for a temperature of 170K. After, it decreases to 500cm2/V.s for T = 300K, and it stabilizes toward a value of 240cm2 /V.s at high temperatures. A region of negative differential mobility is observed. Up to 300K, the curve has a parabolic shape. Beyond this temperature value, the mobility is proportional to the inverse squared temperature. For the two phases of GaN, we calculate the steady-state electron drift velocity versus electric field E, for n =For the two phases of GaN, we calculate the steady-state electron drift velocity versus electric field E, for n =1017cm-3 at 300K [16-17-21]. The results are illustrated by Figure 2. • For weak fields; the ionized impurities and acoustic phonons scatterings dominate. The free carriers remain a majority in the  valley where their effective mass is weak. Their speed increases with the electric field to reach in the case of c-GaN, a maximum of 3.25×107cm/s for a critical field of 110kV/cm. For h-GaN; the peak is approximately 3×107 cm/s for a critical field of 170kV/cm. The differences between these values come from the separations between the central and upper valleys, which are different. In our simulation, we have adopted the more traditional intervalley energy separation, i.e., the first upper conduction band valley minimum is about 3eV for h-GaN, and about 1.5eV for c-GaN, above the lowest point in the conduction band. strength, i.e., a region of negative differential mobility is observed. This is the polar optical phonon scattering mechanism which dominates. • The electron saturation drift velocities are in the order of 2.43×107 cm/s for c-GaN, and 2×107 cm/s for h-GaN. In this range of temperatures; for c-GaN, the upper valleys are already beginning to saturate, limiting the power for electrons to move. However; for h-GaN, the free carriers are just starting to immigrate the  valley, their number is low and they have more free space to move. The results are in satisfactory agreement with those given in references  and . At present, GaN is widely used in the manufacture of field effect transistors operating at high temperature, high power and high frequency. There, the electric fields vary very suddenly, and no stationary effects could happen. It is therefore essential to explore its behavior in the transient regime. Hence, the electron velocity in the material when it is subject to levels of electric fields is calculated. After a time of drifting in an electric field of 10kV/cm, we apply respectively the levels of 100, 150, 200 and 400kV/cm, for the two phases. The velocity variations in terms of time are illustrated by Figure 3. • Up to a level which is below the critical field (110kV/cm for c-GaN and 170kV/cm for h-GaN), the effect of overshoot does not happen.In applying a unit pulse higher than the critical field; the electrons gain a greater energy in the  valley where they have a low mass. They are getting a great acceleration which enables them to reach the electron peak velocity (an overshoot). At the same time, these carriers reach quickly the upper valleys where they become heavier. Their velocity decreases toward its stationary value in a very short time with the same amount. • In the case of c-GaN: for E = 150kV/cm and 200kV/cm; the velocity reaches peaks of respective 5.2×107cm/s and 6.45×107 cm/s, in a time equal to 0.1ps. For E = 400kV/cm, the peak is of 9×107 cm/s, at t = 0.05ps. • In the case of h-GaN; the peak begins to be distinguished at a field level of 200kV/cm, it is equal to 3.3×107 cm/s at t= 0.1ps. For 400kV/cm, it is equal to 5.4×107 cm/s at t = 0.07ps. • Peaks and fronts of ascent and descent are more pronounced when the field increases. They are more pronounced for c-GaN, for considered electric field levels. • When the applied electric field is low: The acoustic phonon and ionized impurities scatterings dominate at low temperatures; at high temperature, the polar optical phonon scattering prevails. • When the applied electric field is strong: The polar optical phonon dominates at low temperatures. However,when the temperature increases, the scatterings of acoustic phonons and intervalley polar optical phonons becomen the dominant mechanism. In the stationary mode: For T = 300K and n = 1017cm-3; the best velocity is obtained for c-GaN. In the transitory mode: The performances of c-GaN are significantly higher than those of h-GaN. Our results are in good agreement with those given in references and where they use the model of three is otropic and nonparabolic valleys. They are also in good agreement with those provided in reference and where an EMC with nonparabolic bands is used, and in reference where a full description of the band structure is considered.